I don’t pick up. I’m standing by the machine listening to my mother’s voice tell me that she wants to stop by and see the baby. She can’t. I don’t pick up because I don’t know what to tell her. My baby is fine. He’s warm and loved and fed. I’m not fine, but she won’t be ignored. I know this about her. An hour passes and she rings again. This time I pick up as soon as I hear her voice. Sorry mom, I just got home, I lied. No, today won’t work. I’m heading out again. She wants to know where I’m going. Not enough time has passed between childhood and adulthood. She is still the mother telling me what to do. She tells me it’s too cold to take the baby out and she’s right. I’m actually not taking the baby out. I’ve been hiding in my house all day. I will hide in my house the remainder of the week. Maybe tomorrow, I say. Then what? What will I say tomorrow? I will say I’m sick. I must put her off. She doesn’t believe me. You don’t sound sick. It’s a stomach thing. Let’s plan for Friday. Friday I will appear to be fine, I tell myself. I open the door on Friday. She is snuggling the baby as I sit watching, waiting, hoping. She looks up with a smile that begins to fade. She is studying my face. What’s wrong with your eye? Nothing. You have a faded bruise under your eye. Oh that. The dog jumped up as I bent down, I lied. You stand at the bottom of two roads. or choose right, or choose wrong. because neither road seems bad or good or bad or good or good or bad. Days turn into nights turn into days turn into nights. Different people, different places, different animals, different loves, and different losses to experience. Sunshine or storms or moonbeams or rainbows. Indecision is a loud buzzing in your ears. Mystery is swirling around your head. Your life has become blurry. There is no sign, no epiphany, no wise old owl. written on receipts and napkins and post-it notes. Your life, on a post-it note. Who do you think you are coming into this place? This place occupied by me, only. The door was closed. “But you left it unlocked,” you said. You, with your damaged spirit, threadbare and see-through. So open. So goddamned open. Laying your soul bare. Lifting it high into the air and letting it fall to the ground with all four corners of your heart showing. Not one corner tucked. And mine. Cracked. An open fissure mending slowly on it’s own. Your words, a cool, soothing salve. We suffered indifference. Like sand clinging to our skin we gently brushed it from each other. We were hungry. So very hungry. his voice wakes her every morning with a song. A brand new year. Another birthday ahead, and the determination to stay strong, healthy and fit. But it takes motivation. And it takes playing tricks on yourself. It’s cold. It’s late in the day. Fighting the urge to go home, turn up the heat, cuddle with the cat in front of the TV, drink beer, and eat popcorn. You know yourself. You know that if you don’t change into your running clothes at work and steer clear of home until after, you won’t run. So you fool yourself into believing that you would rather run by going through the motions of putting on your bright green Merrells before stepping out of your office. Then you make the first excuse as you drive your car away from work to the intended parking spot just down the road, where you have parked countless times before, and taken off from on your feet. In 15 minutes it will be too dark to run on that isolated one lane road through the vineyards. Where to now? Home? No. Yes. No. The track. Intervals. It will be almost dark, but there won’t be cars that can’t see you dressed in all black. Blocks from home you park your car, put your earphones in, and pick a favorite song to get you moving. The motions. Forward motion. Act like a runner and you become a runner. And you do. And you are. And it feels good. You round the corner on your fourth lap and see half of the glorious moon peeking out from the mountain. The moon that wasn’t there when you rounded the corner on your third lap, and by the fifth lap it sits low and big and full. 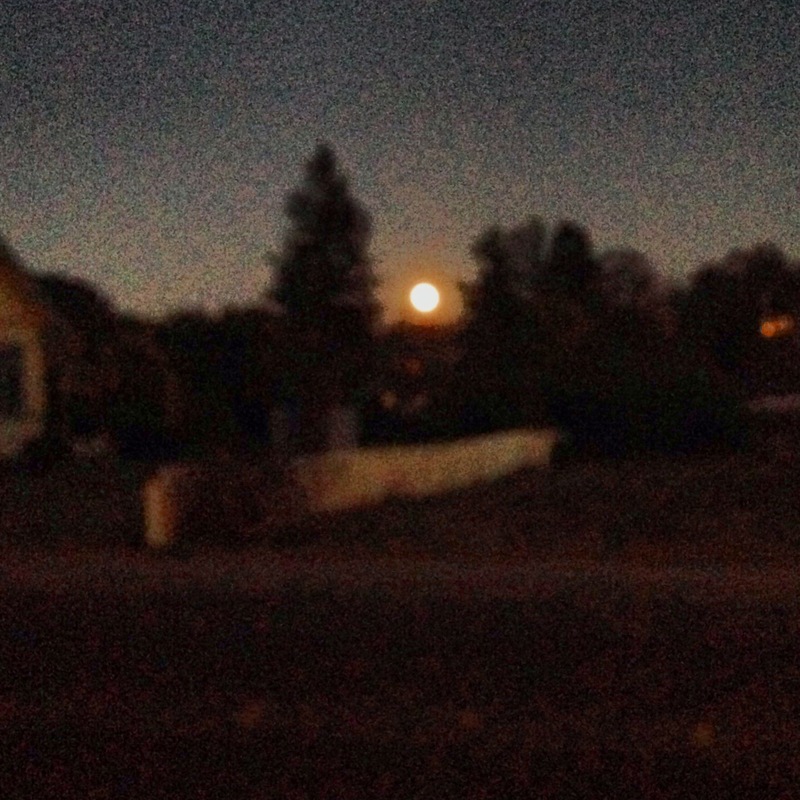 And you are happy knowing you would have missed the moonrise if you had gone home. Wednesday nights have recently become one of my favorite nights of the week due to a small writing group with a few of my nearest and dearest. I’m in the company of women who I love and trust and it was just the sort of “kick in the pants” I needed to get words flowing again. The structure is rather loose, though we all joined an online community perfect for organizing small groups where we can post our writing ahead of time for discussion and critique when we meet. It’s working well. One of our more experienced writers (ahem), thought an assignment might be a good idea and she was right. Two weeks ago she gave us the lyrics to the Norah Jones song, Humble Me, and told us to write whatever we wanted using the song as inspiration. It could be a poem, a short story, whatever. The one thing we all had to do though, was use the same line, It never rains when you want it to, somewhere in our piece. starting point and back again. and with a glance at them, I feel strong. the one whose fruit was sour last week. out and back, turning around. pluck the fruit no bigger than a cherry. where I pluck another, then another. sweet juice and spitting out the pit. The athlete becomes the dreamer. full of too much fruit, I walk. too become victim and then I give in. This is no longer a run. And so, I will dream. for an old hoodie I swiped from my son. I gave in to the words. The heart woke the mind. between the heart’s passion and rational thinking. I may forget this if I don’t write it down. Turn up the heat and put the coffee on. I’m on my third cup when the alarm sounds to wake me. The cat is happy I’m up on this colder than average morning. on the other side of the glass. With a belly full, he curls up on my lap. as I ignore his needs to satisfy my own. always punching the clock a little late. always knowing that real life will never stifle my true self. The Good. The Bad. The Customer Service. On the way to what, I still don't know. Writing what it is I have to say. . .